You can add chopped jalapeño if you prefer a spicy gazpacho. 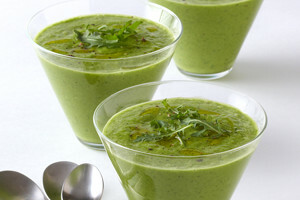 In a blender, combine all of the ingredients except the reserved arugula leaves, 3/4 tsp. salt, 1/4 tsp. pepper, and 1/2 cup water and blend until smooth. Transfer to a container, cover, and refrigerate until very cold, at least 2 hours. If the mixture is too thick, thin with cold water to your desired consistency. Ladle the soup into serving bowls. Drizzle with extra virgin olive oil, and garnish with the reserved arugula leaves.